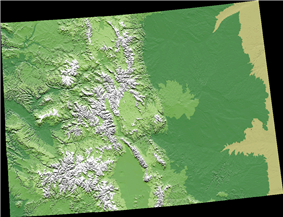 A digital elevation model relief map of Colorado. The geography of the state of Colorado is diverse, encompassing both rugged mountainous terrain, vast plains, desert lands, desert canyons, and mesas. The state of Colorado is defined as the geospherical rectangle that stretches from 37°N to 41°N latitude and from 102°03'W to 109°03'W longitude (25°W to 32°W from the Washington Meridian). Colorado is one of only three U.S. states (with Wyoming and Utah) that have only lines of latitude and longitude for boundaries. The summit of Mount Elbert at 4,401 meters (14,439 feet) elevation in Lake County is the state's highest point and the highest point in the entire Rocky Mountains. 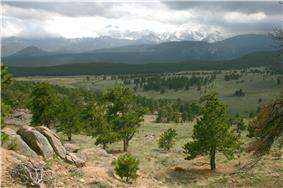 Colorado has approximately 550 mountain peaks that exceed 4,000 meters (13,000 feet) elevation. Colorado is the only U.S. state that lies entirely above 1,000 meters (3,300 feet) elevation. The state's lowest elevation is 1,010 meters (3,310 feet) at the point on the eastern boundary of Yuma County where the Arikaree River flows into the state of Kansas. To the east of the Rocky Mountains in Colorado are the Colorado Eastern Plains/High Plains, the section of the Great Plains within Colorado at elevations ranging from 3,500 to 7,000 feet (1,100 to 2,100 metres). The Midwest states of Kansas and Nebraska border Colorado to the east and northeast. The plains are sparsely settled with most population along the South Platte and the Arkansas rivers. Rainfall is meager, averaging about 15 inches (380 mm) annually. There is some irrigated farming, but much of the land is used for dryland farming or ranching. Winter wheat is a typical crop and most small towns in the region boast both a water tower and a grain elevator. The bulk of Colorado's population lives along the eastern edge of the Rocky Mountains in the Front Range Urban Corridor. This region is partially protected from prevailing storms by the high mountains to the west. 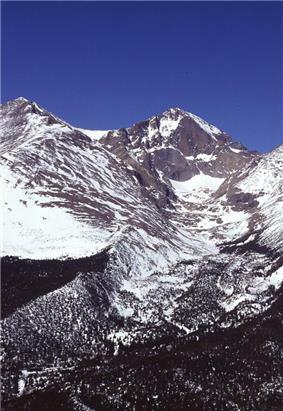 Snowpack accumulation at 14,255 feet (4345 m) on Longs Peak in Rocky Mountain National Park. To the west lies the eastern slope of the Rocky Mountains with notable peaks such as Longs Peak, Mount Evans, Pikes Peak, and the Spanish Peaks near Walsenburg in the south. This area drains to the east, is forested, and partially urbanized. With urbanization, utilization of the forest for timbering and grazing resulted in accumulation of fuel. During the drought of 2002 devastating forest fires swept this area. The Continental Divide stretches along the crest of the Rocky Mountains. To the west of the Continental Divide is the Western Slope. Water west of the Continental Divide drains west into the Pacific Ocean via the Colorado River. Western Colorado is made up of mountains, mesas, desert canyons, and desert lands. Within the interior of the Rocky Mountains are several large parks or high broad basins. In the north, on the east side of the Continental Divide is North Park. North Park is drained by the North Platte River, which flows north into the northwest state of Wyoming. Just south but on the west side of the Continental Divide is Middle Park, drained by the Colorado River. South Park is the headwaters of the South Platte River. To the south lies the San Luis Valley, the headwaters of the Rio Grande, which drains into New Mexico. Across the Sangre de Cristo Range to the east of the San Luis Valley lies the Wet Mountain Valley. These basins, particularly the San Luis Valley, lie along the Rio Grande Rift, a major tectonic feature. See Rift. The Rocky Mountains within Colorado contain 54 peaks that are 14,000 feet (4270 m) or higher, known as fourteeners. The mountains are timbered with conifers and aspen to the tree line, at an elevation of about 12,000 feet (3,650 m) in southern Colorado to about 10,500 feet (3,200 m) in northern Colorado; above this only alpine vegetation grows. The Rockies are snow-covered only in the winter; most snow melts by mid-August with the exception of a few small glaciers. The Colorado Mineral Belt, stretching from the San Juan Mountains in the southwest to Boulder and Central City on the front range, contains most of the historic gold and silver mining districts of Colorado. The Western Slope is generally drained by the Colorado River and its tributaries. Notable to the south are the San Juan Mountains, an extremely rugged mountain range, and to the west of the San Juans, the Colorado Plateau, a high desert bordering Southern Utah. Grand Junction is the largest city on the Western Slope. Grand Junction is served by Interstate Highway I-70. 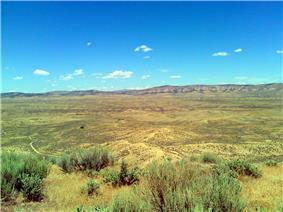 To the southeast of Grand Junction is Grand Mesa, a large flat-topped desert mountain. Further east are the ski resorts of Aspen, Vail, Crested Butte, and Steamboat Springs. The northwestern corner of Colorado bordering Northern Utah and Western Wyoming is mostly sparsely populated rangeland. From west to east, the state consists of desert basins, desert canyons and mesas, turning into desert plateaus, then alpine mountains, and then the grasslands of the High Plains. Mount Elbert is the highest peak in the Rocky Mountains of North America. The famous Pikes Peak is just west of Colorado Springs. Its lone peak is visible from near the Kansas border on clear days. ^ State of Colorado. "Colorado State Archives Geography Page". Colorado Department of Personnel & Administration. State of Colorado. Retrieved 22 September 2012. ^ Blake, Kevin S. 2002. Colorado Fourteeners and the Nature of Place Identity. Geographical Review 92(2): 155-179.